Quail Hill homes are located in the coastal area of Irvine, California. The Quail Hill community is located in the Oceanside of the 405 freeway and near the communities of Turtle Rock and Turtle Ridge in Irvine. Quail Hill offers a variety of single family homes and residential townhouse neighborhoods. The communities consist of Ambridge, Casalon, Chantilly, Ivy Wreath, Jasmine, Laurel, Linden, Olivos, Sandalwood, Sage, Sienna, Soltice, Tapestry and Vicara. All the Quail Hill community homes are under a homeowners association with monthly dues required. The dues include use of the three Quail Hill Olympic size community pools, fitness center, tennis and basketball courts and 5 parks. The Quail Hill shopping center has a variety of stores while the city of Laguna Beach is just minutes away. 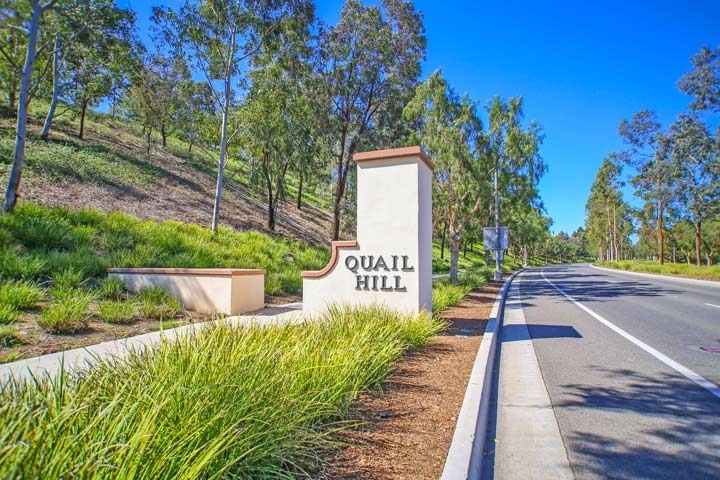 Below are the current Quail Hill homes for sale and for lease in Irvine, California. Please contact us at 888-990-7111 for more information on this community and any of the homes listed for sale here.